Kleefeld on Comics: On History: The Man Who Walked with Dinosaurs? I made a passing reference yesterday to V. T. Hamlin, the creator of Alley Oop. His Wikipedia entry notes that after he retired from cartooning, he wrote an autobiography entitled The Man Who Walked with Dinosaurs. I've read a little about Hamlin, but it's all third-hand information, so I thought it might be good to track down a copy of his autobiography. I'm wondering, though, does it actually exist? The Wikipedia article cites this piece as the source of the autobiography claim. Steve Stiles in his piece called "The Man Who Walked with Dinosaurs" also notes that Hamlin wrote an autobiography under that title. I've seen the claim pop up in repeated biographies of Hamlin as a sort of coda, but no one ever seems to cite it directly. Well, almost no one. Robert Harvey does quote from it for his biography of Hamlin that appeared in The Comics Journal. Harvey's a solid historian and researcher, so he's certainly read it, but there's a passing mention in the same piece that the autobiography had gone unpublished. So where did he get it, and why do so many people cite it? A little more digging led me to the Special Collections at the University of Missouri Libraries. 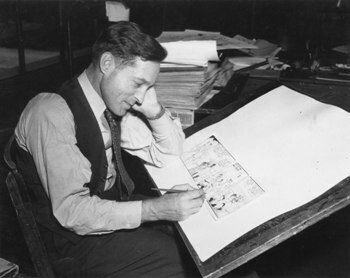 Hamlin's daughter presented a sizable collection of Hamlin's comics work to the library in 1991 and among the listings are a 73-page "unpaged typescript" called The Man Who Walked with Dinosaurs and a "transcript by Frank Stack" of something else by the same title. These must be what Harvey saw and others keep referring to. If the autobiography only clocks in at 73 pages, I'm inclined to believe it's incomplete. I mean, that's fewer pages than one of those 80-page giant comics DC used to do in the 1970s. Seventy-three pages isn't even a thick magazine, much less an autobiography. It's not like Hamlin just cut his stories short or anything either -- he spent four decades telling Alley Oop stories for a living! So I get why it wasn't published before, and why it might remain unpublished. But it seems a shame that the only way to even look at it is to head out to the University of Missouri and flip through the one copy that seems to exist anywhere. Kudos to any/all comics researchers who are willing/able to travel around the country, or even the world, to different libraries and collections to dig up unique treasures like this! My next book will draw heavily from a sketch autobiography by Iowa State University's president during one of the school's most interesting eras. It's about 80 pages, absolutely fascinating, and has also never been published, even in an alumni magazine or something like that. I have thought, more than once, "it's terrible that this is just buried in an archive" and that it really ought to be published online somewhere at the very least. That said, it has occurred to me that the ISU archives alone probably contain countless documents at least as deserving. Maybe some day, society will permit the necessary effort without "who would pay for it" being an issue. Until then, though, I'm quite glad to contribute what little I can.